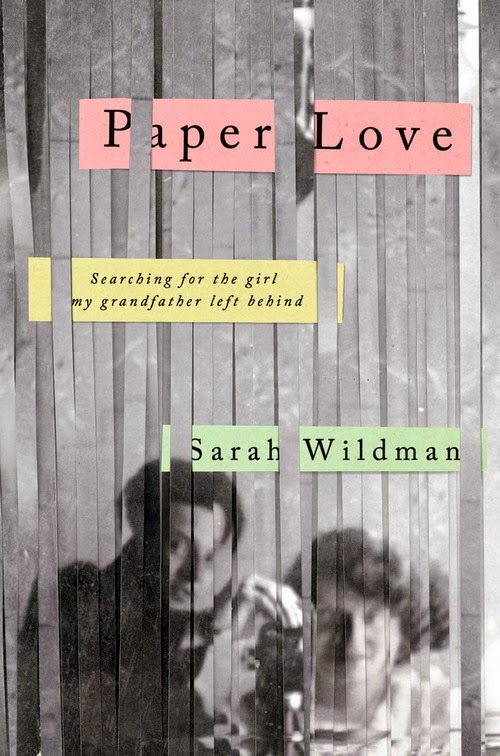 Sarah Wildman is the author of the book Paper Love: Searching for the Girl My Grandfather Left Behind. Her writing has appeared in a variety of publications, including The New York Times, Slate, and The New Yorker. She lives in Washington, D.C.
Q: Why did you decide to write this family memoir? A: Paper Love isn't actually a family memoir - it's a search story, a love story, an investigation into family myth and memory. I found a folded note - of the kind we all used to pass in the pre-texting era - in each quadrant was a “selfie” of the 1930s, a photograph of a girl, and under each was a caption - she wanted my grandfather to write to her. It was dated 1939. I showed it to my grandmother and she said, "That was your grandfather's true love." It was such a remarkable statement, and offered without commentary. I wanted to see if I could find this woman. Had she survived? What did she mean to the story of my grandfather? What did she mean to me? In many ways I have always seen myself - as so many of us do - as an accidental American, here on these shores because of the apocalypse of the 20th century and the (often super daring!) choices my grandfather made as the Nazis took over Vienna, Austria, where my family lived then. That history has been a part of my consciousness forever, since I learned my name. Filling out the details of his story, writing through the holes he purposefully left in his narrative, then was really about understanding who I am, and how to explain who we are to my children. Here's what I knew: My grandfather had had a lover he left behind when he fled Vienna. Discovering that was both painful and tantalizing. I wanted to know more. A: The research was really multi-layered - it began when I discovered a box of letters in my parents' basement in a file box mislabeled "Patient Correspondence, A-G."
The letters were not from patients but from my grandfather's entire exploded Viennese world. Dozens upon dozens were from a woman named Valerie - Valy - Scheftel. She was his girlfriend at the University of Vienna Medical School, and she had remained behind when he fled in 1938. What had happened to her? Where did she go? And why didn't she go with him? These questions came up for me immediately. Her letters offer a lot of information - the places she wrote from, the many places she lived, and where she worked - but they were also censored so to fully understand what was happening, I needed to match up her letters with the restrictions Jews were under in the Reich, and to find the material the state had kept on her. I spent years and years going through archival material, matching up official Gestapo documents with the letters that I found, in Austria and in Germany and in the Czech Republic, and in this country. I did hundreds of hours of interviews with survivors, Holocaust historians, and third generation on both sides of the Atlantic. I read and read and read - books on letter writers, books on specific geographies, books on the way Jews lived under the Reich in Berlin, Vienna, the Czech Republic, elsewhere. The biggest surprise was that in the archives of the International Tracing Service - the last unopened major Holocaust archive in Germany - someone else had come looking for Valy before me. Finding that person took me years, but when I did, it opened up a whole new world of material, and allowed me to discover the full story of the woman my grandfather left behind. Q: How did your impression of your grandfather change as you learned more about his life? A: For one it expanded my picture of his pre-war world, enormously. This became so much more than my grandfather, and really about the way we all live - who are the people around us? I had never really considered what his world had looked like, before he fled. This book opened that up for me, completely. Who were the people he went to school with? What happened to them? It was an incredibly modern world. It was an extraordinary situation, but it felt very relatable. What happens when everyone you've ever known has scattered, or dies? My grandfather was always the hero of my family - larger than life, the man who could do no wrong, the man who had no wrong answers. Everything was "herrlich" - wonderful. What I discovered in the archives, and through these letters, was that he had nothing under control when he arrived on these shores. That he was so poor his mother was selling the last pieces of jewelry she owned. That he nearly failed. Knowing all this meant I suddenly had a chance to know him as a man - as a flawed person, like the rest of us. If anything it only made me love him more. Q: How was "Paper Love" selected as the book's title? A: Paper love is a bit of a play on words - it is about the love affair I discovered on paper, the mysteries afforded by paper, the paper trail of the letters sent by a woman desperately in love with my grandfather, and desperate to escape the Nazis, and the love of paper itself, the way in which this path has led me through thousands of pieces of paper. A: I work on stories on the intersection of culture and politics, history and memory - stories that speak to identity, and who we are now, and how we got here. I like to see how history plays a role in current debates - immigration, religion, culture wars and I'm always looking for quiet, unexpected stories that stay with you. A: I think the story of this book was as much about my own family as about an effort to understand the Nazi effort to erase one woman as well as exterminate a people. My hope was by telling, as fully as I could, the story of one small group of people, I could do something to un-erase them from history. It's not a word! I know! but it was really that - to take this one, normal, incredibly intelligent woman, to let her really be heard, to allow her to have a bit of a voice in history, to show you how incredibly important she became to me. --Interview with Deborah Kalb. Sarah Wildman will be participating in the Hyman S. and Freda Bernstein Jewish Literary Festival, which runs from October 19-29, 2014 at the Washington DCJCC.